At Axiom Care Solutions, we believe that building healthy, lasting relationships is the starting point for supporting the needs of our clients and family members. This is why we’re always happy to meet with you and your family members to discuss whether our services might be a good fit for your situation. We’re proud to offer a free no-obligation consultation in your home where you’ll have a chance to ask questions, clarify expectations and discuss a preferred approach. The first person you’ll meet will be our talented Client Services Coordinator – a Nurse – who’ll work with you and your family in your own home to better understand your concerns, assess your needs and help develop a customized individual plan for your loved one. 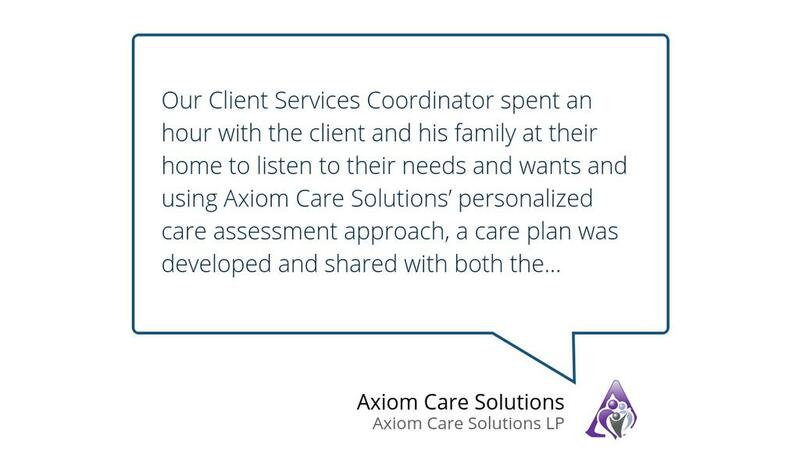 Call us today at 604-900-9377, email us at info@axiomcaresolutions.com or contact us using the feedback form below.